A big thanks to the We Grow Retreat for hosting me in order to write this post. The retreat was sponsored by Mediavine, so a big thanks goes out to them too! Heading to Universal Orlando Resort soon? If so, you’ll definitely want to plan out where to eat at Universal CityWalk. After a long day in the park, it’s refreshing to sit down at one of the many restaurants in CityWalk Universal. Breaking bread with family or friends (or both) on vacation is always worth the splurge for me. That’s why I’ve put together this post of where to eat at Universal CityWalk. Look no further for the best restaurants in CityWalk. I want you to be able to enjoy a fun meal that is worth every penny on your next vacation to Universal Studios Orlando. Those of you who know me well know that I travel mostly to enjoy new foods. Other than my family, nothing brings me more joy than eating a new dish at a new restaurant on vacation. Which is why I am always searching for unique places to eat, even at theme parks. So when I visited Orlando with the We Grow Retreat I knew I wanted to find the best restaurants in Universal CityWalk, you know, the ones that are totally worth the splurge! When we visit theme parks like Universal Studios Orlando, we try to do something for each member of the family. The kids get to ride rides (that don’t scare them) and meet characters, but Tom and I go for the food. My requirements for dining out at theme parks include a unique menu and decent prices. I don’t mind splurging on good food, but I’m not about to pay for fine dining prices with kids at a theme park! That’s why I love the restaurant selection at Universal CityWalk. Every single restaurant is reasonably priced and themed just well enough to delight and entertain small children. Before I can tell you where to eat in CityWalk at Universal Studios, I need to explain CityWalk to you. Already know all about it? Feel free to skip ahead to the next section. Universal CityWalk is the entertainment and dining hub of Universal Studios Orlando. There is no entry fee, and parking is free after 6 pm (except during Halloween Horror Nights when parking is $22-30). It’s located between Islands of Adventure and Universal Studios, which means it’s completely walkable and accessible to everyone who enters either park. This makes it a great option for dinner and entertainment when visiting Universal Studios Resort. All of the resorts are in walking distance too. There are restaurants, a movie theater, mini golf, and the Blue Man Group show. With so much to do you could make a whole day of exploring Universal CityWalk if you need a day off from rides or just want a fun day in Orlando. If you’re like me, you are probably trying to figure out what to eat at Universal CityWalk. Some people research rides before visiting theme parks, I research food. Keep scrolling to view the complete list of restaurants in CityWalk, but before you do, take a little detour here to read about the three places you must eat when visiting CityWalk. Since I’m a huge fan of unique food, I’m always trying to avoid the tourist traps to seek out the best restaurants. This can be difficult on vacation with kids… at theme parks. Lucky for me, Universal CityWalk caters to grows ups like me and has some of the coolest places to eat that make kids and adults happy. Here are the three that you absolutely have to try because they are not only delicious, but totally worth the money. When I asked my Instagram and Facebook followers where I should eat in CityWalk, every single person who responded said I should eat at Toothsome. Every. Single. One. BTW- click those links above for Instagram and Facebook and give me a follow! I’m always asking my Insta and Facebook friends and followers questions like this. I’d love for you to be a part of my community too. If you know me at all, you know that I’m a fan of chocolate, but I’m much more into savory than sweets. 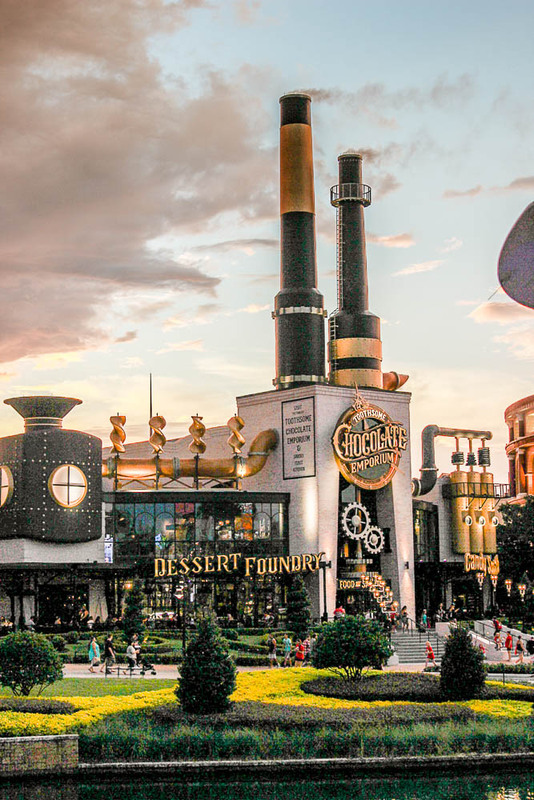 I was a little nervous to eat at The Toothsome Chocolate Emporium because I figured it would be too touristy and full of overpriced and overly sweet treats. I couldn’t have been more wrong. Toothsome includes “Savory Feast Kitchen” in the name because the savory menu items truly are feast worthy. Every item on the menu is unique and everyone at my table (12 people) was happy with the food. While we all enjoyed our meals, I’m confident that everyone was most excited about dessert. 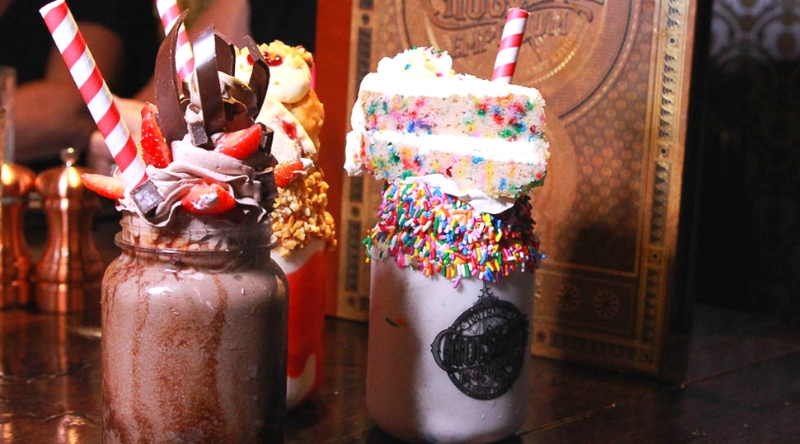 Toothsome is known for over the top milkshakes that come in a plastic mason jar that you can take home! 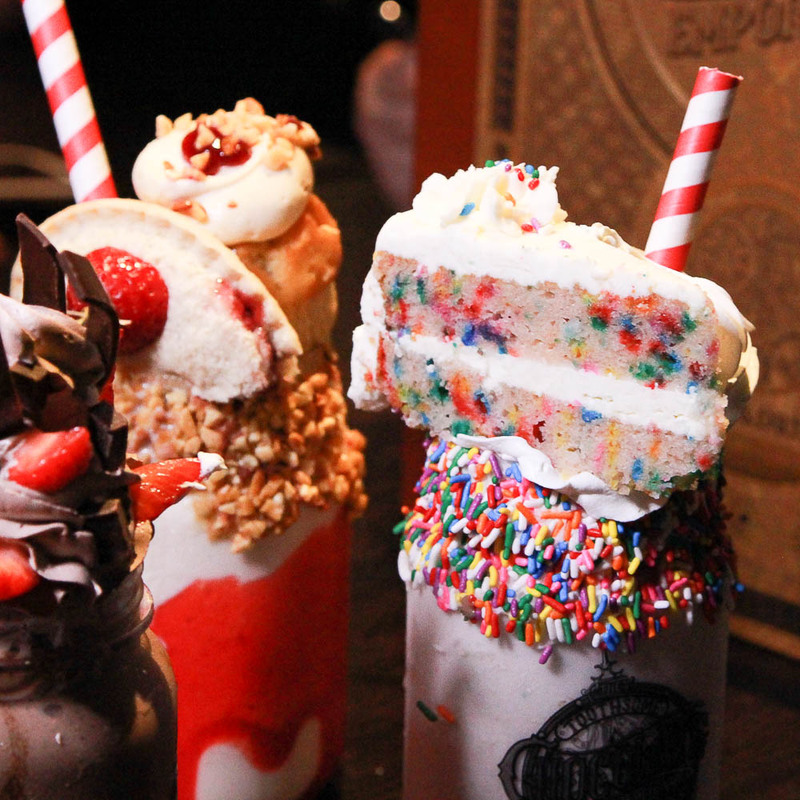 You can order a Toothsome milkshake to go! It’s not uncommon to see people walking around CityWalk Universal with these enormous milkshakes in their hands. Want one, but don’t want to sit down? You’re in luck! 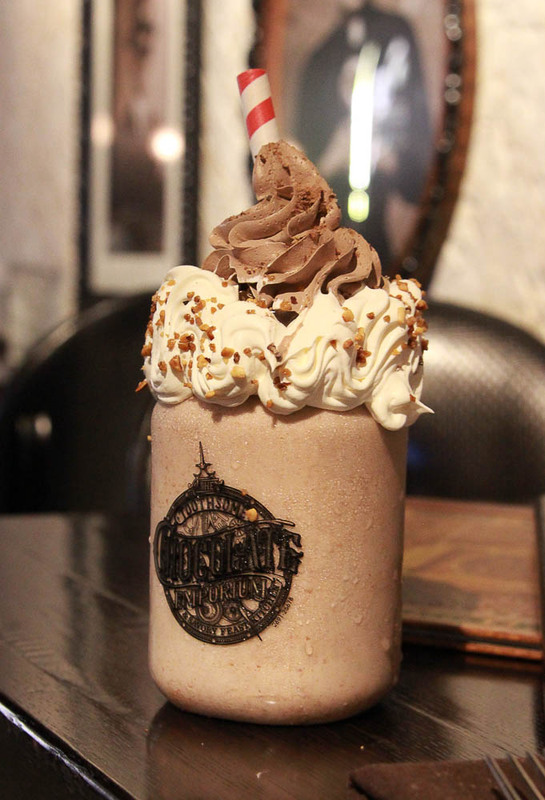 You can order a milkshake to go at the chocolate shop downstairs. Have you ever wanted to eat sushi, but someone else in the family wanted a burger? 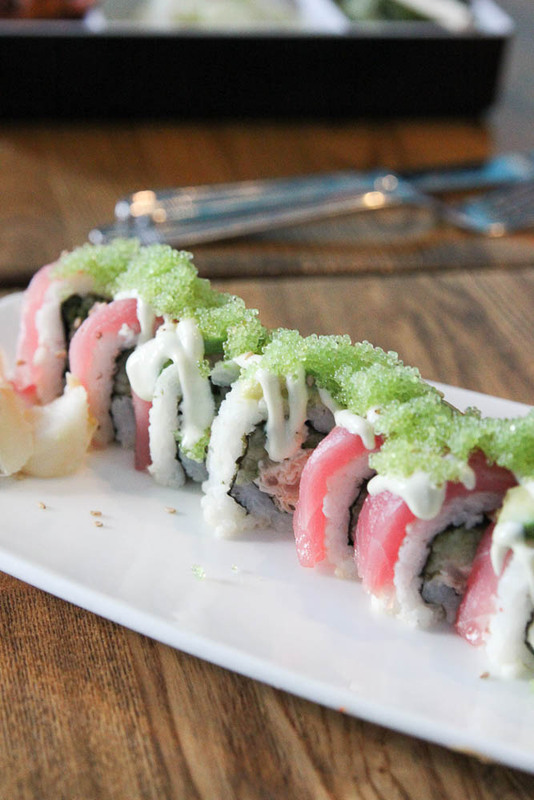 If so, The Cowfish Sushi Burger Bar is the place for you. Someone on Instagram messaged me and asked why it was called Cowfish and it took me a few minutes to realize that it’s called Cowfish because the restaurant serves cows and fish. Get it? Total blonde moment for me (and I’m not even blonde). Anyway, this place is known for- you guessed it- sushi and burgers. Want both? You’re in luck! 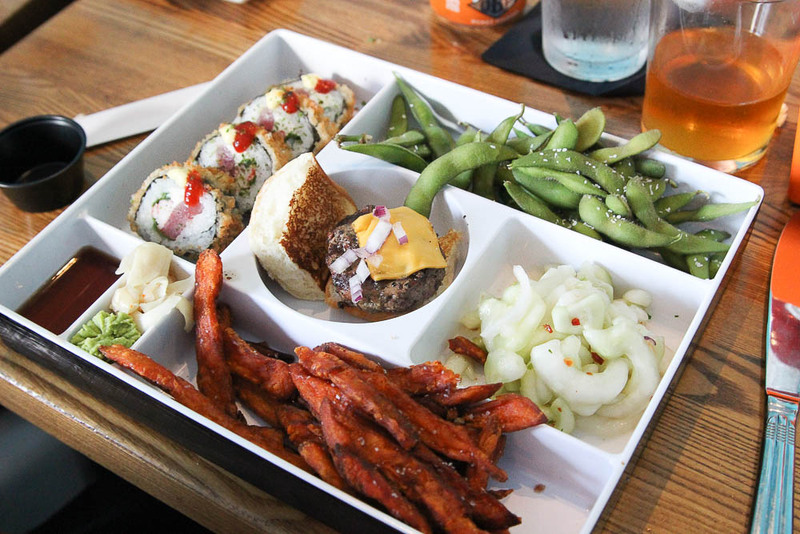 You can order a bento box that comes with sushi and a burger! 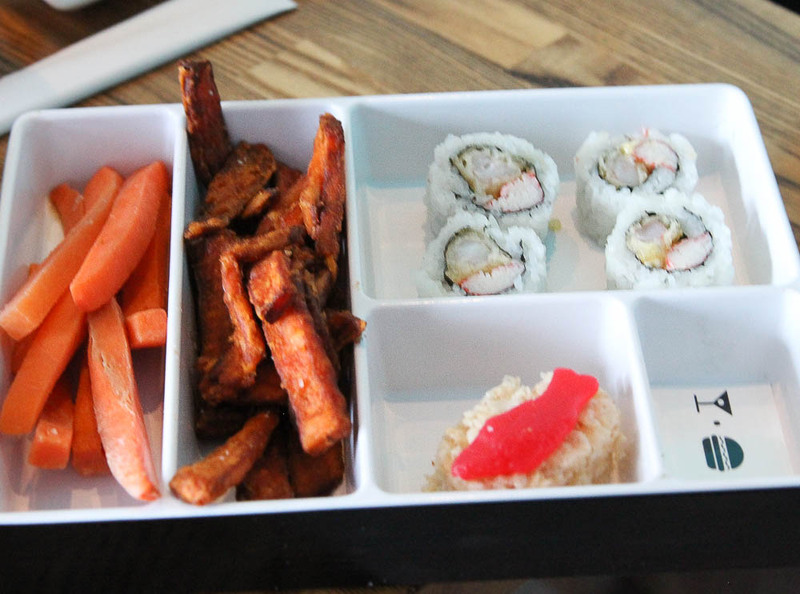 Even the kids can get in on the fun with a kid sized bento box. Of course I had to get a speciality drink too. 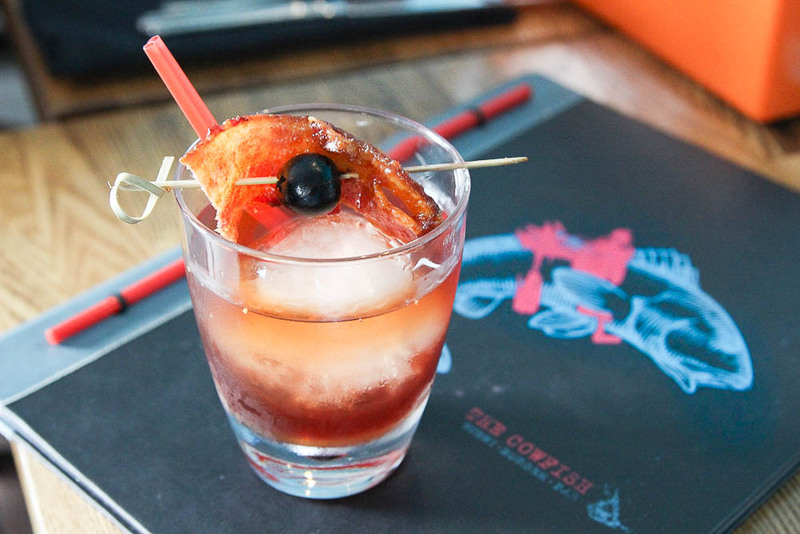 The Bacon Bourbon did not disappoint. 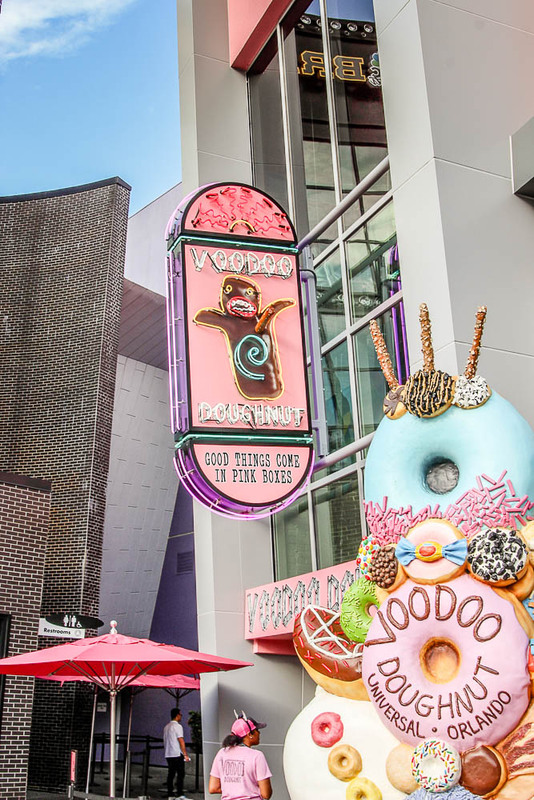 A trip to Universal Orlando CityWalk isn’t complete without a stop at Voodoo Doughnuts. Even if you don’t like donuts, this is worth it. The prices are actually shocking. In a good way. I was expecting to spend $5 for a donut, but was happy to see the prices range from $1.75 to $4. 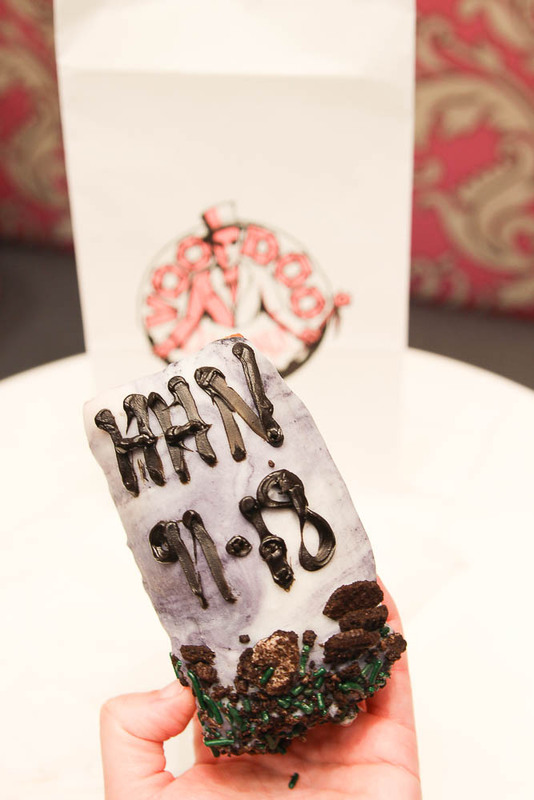 Since we were there for Halloween Horror Nights, I had to try the special donut made just for the event. Let me tell you something: I’m not a fan of filled donuts, but the filling on this was amazing. I’ve never in my life been so impressed with a jelly filled donut. Pro tip: Get a Voodoo Doughnut at Universal CityWalk when you see a short line. The line can literally be hours long just to get a donut! Don’t pass up the opportunity to get one when the line is short. 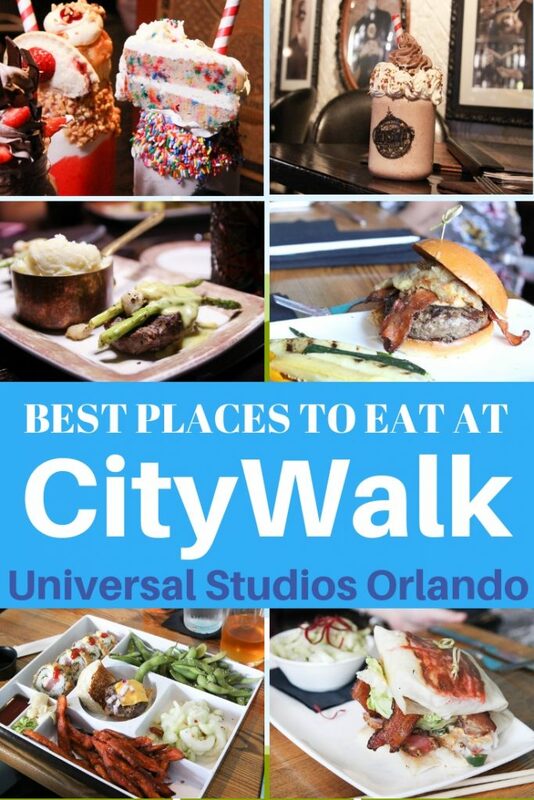 Now that you know my favorite places to eat in CityWalk, I’ll list all the restaurants. I realize that not everyone likes to eat the way I do, so here is a complete list of all the places to eat in CityWalk Universal. When it comes to dining at Universal CityWalk, there truly is something for everyone. There are uber touristy places and unique spots that you probably have never heard of. You can even find quick fast food joints. Here is a list of all the places to eat in CityWalk Universal. Does Universal Have a Dining Plan Option? Yes! If you buy a Universal Studios Resort vacation package then you have the option to buy a Universal Dining Plan. Which CityWalk Restaurants Participate in the Universal Dining Plan? It’s my professional opinion that dining at Universal CityWalk is worth the splurge. You know I’m not one to sugar coat things. I’ve been very open and honest about my opinions. For instance- I’ll never eat a meal at SeaWorld ever again (Discovery Cove is another story- I’ll eat there all day). I have high standards for dining out. I need my food to be amazing and well worth the money. I’m happy to report that the food at Universal CityWalk won’t leave you disappointed! Oh my goodness, those milkshakes look insane, Hannah! It really sounds like you guys had an amazing retreat — we are so glad we could be a part of it! It really was a great retreat! Thank you for being a sponsor!